Description and tracking of the liquid deformable interface under the effect of external forces and convective flows. Differential evaporation of the liquid droplet components. Combustion of the droplet, including gas phase and liquid phase reactions. 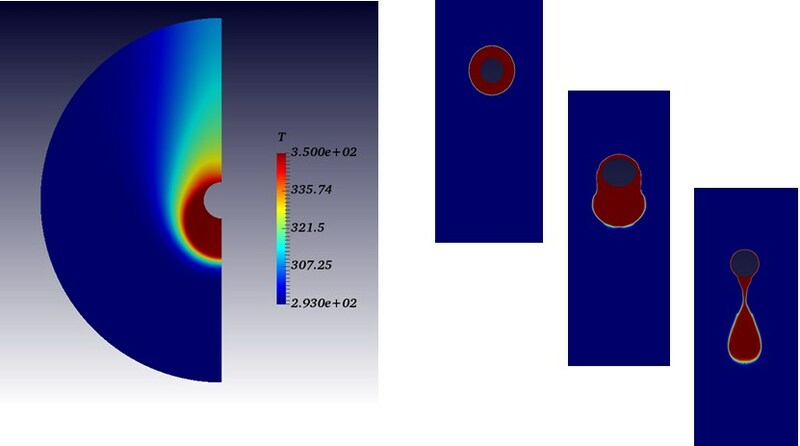 This new PhD project, directed by our project partner Politecnico Di Milano, aims at the detailed modeling of the evaporation and combustion processes of 2-D and 3-D fuel droplets of bio-fuel. The potential applications first involve detailed fundamental studies on isolated droplet evaporation and combustion, which will also have an impact on different technological fields, such atomizers, sprays and bio-fuel combustion in real applications. The characterization of this complex mixture is very challenging, as well as the modeling of its evaporation (modeled with a detailed thermodynamics, also accounting for non-idealities of the mixture) and combustion (both liquid and gas phase reactions). Different physical phenomena have to be taken into account, such as surface tension, natural convection, radiative heat transfer and soot formation. This entry was posted in News and tagged 2-D/3-D model, A. E. Saufi, PhD project. Bookmark the permalink.